Redness, heat, swelling, and pain are the basic characteristics of inflammation described by a Roman physician in the first century. While those characteristics haven’t changed over the millennia, the inflammatory process is generally viewed as a double-edged sword. For instance, the inflammatory response to injury or disease is essential for recruiting the immune system to help the body heal, yet inflammation can also cause an increase in the production of compounds such as thrombin, which can lead to dangerous blood clots and other conditions. Now, a collaborative team of researchers from the Division of Hemostasis and Thrombosis at Beth Israel Deaconess Medical Center (BIDMC) and the Wyss Institute at Harvard University have discovered small molecules called parmodulins that provide anti-inflammatory and antithrombotic protection to endothelial cells without interfering with blood clotting, making them attractive new drug candidates. “We essentially performed a mini-preclinical trial of parmodulins' effect on the endothelium and not only determined the pathway through which parmodulins function, but also demonstrated that they help protect endothelial cells from inflammatory damage,” explained former Wyss postdoc Abhishek Jain, Ph.D., who is now an assistant professor and director of the Bioinspired Translational Microsystems lab at Texas A&M University. The target protein on which both APC and parmodulins act is the transmembrane protein protease-activated receptor 1 (PAR1), which is present on both endothelial cells that line blood vessels and platelets that circulate throughout the blood and promote clotting, making mechanistic analysis difficult. PAR1 was originally identified as a receptor for thrombin, which is a crucial part of the inflammatory process. However, when PAR1 is activated by APC on endothelium, it triggers anti-inflammatory, antiapoptotic, and barrier-fortifying pathways, all of which help protect cells from the negative effects of inflammation. In addition to activating PAR1, APC also independently inhibits the generation of thrombin, which is an essential component of healthy blood clotting—but inhibiting thrombin too much leads to uncontrolled bleeding. Knowing that parmodulins bind to PAR1, the team of scientists and clinicians set out to find a way to activate endothelial PAR1 and reduce thrombic responses without thinning the blood and thus provide a better alternative to APC. To evaluate the activity of parmodulins on endothelium, the researchers incubated human endothelial cells with parmodulin 2 in vitro for 4 hours and then exposed them to the thrombin-inducing inflammatory agents lipopolysaccharide (LPS) or tumor necrosis factor-α (TNF-α). In the parmodulin-exposed cells, both agents' ability to generate thrombin was reduced by over 50% compared with nonparmodulin-exposed cells. However, parmodulin 2 did not inhibit the activity of factor V or factor X, proteins that function in blood coagulation. “We were intrigued by the notion that parmodulin 2 inhibited LPS- and TNF-mediated prothrombotic effects on the endothelial surface without impairing blood clotting” noted lead study investigator Karen De Ceunynck, Ph.D., a postdoctoral research fellow at BIDMC. 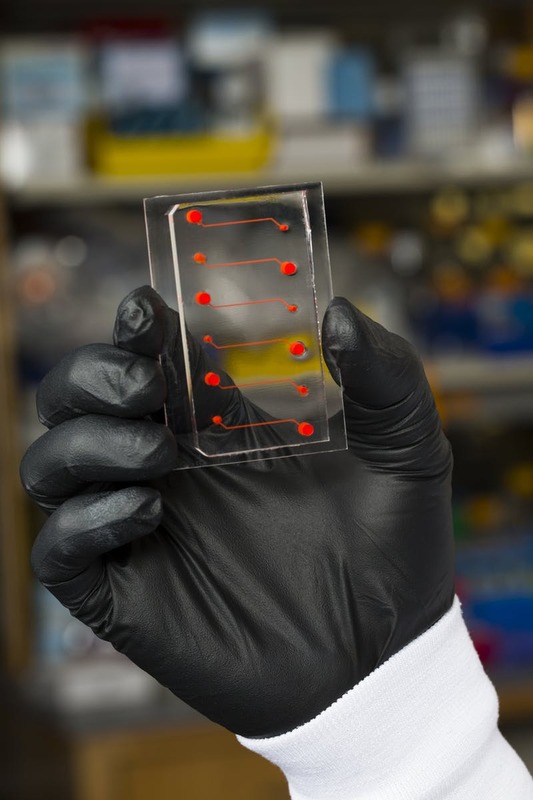 To confirm their hypothesis, the team used a Wyss-developed blood-vessel-on-a-chip consisting of microfluidic channels embedded in a clear polymer chip, coated with collagen, and lined by human endothelial cells. Whole blood was perfused through the chip to simulate the flow conditions within human blood vessels, to which were added different pro- and anti-inflammatory compounds to evaluate the response of the endothelium. 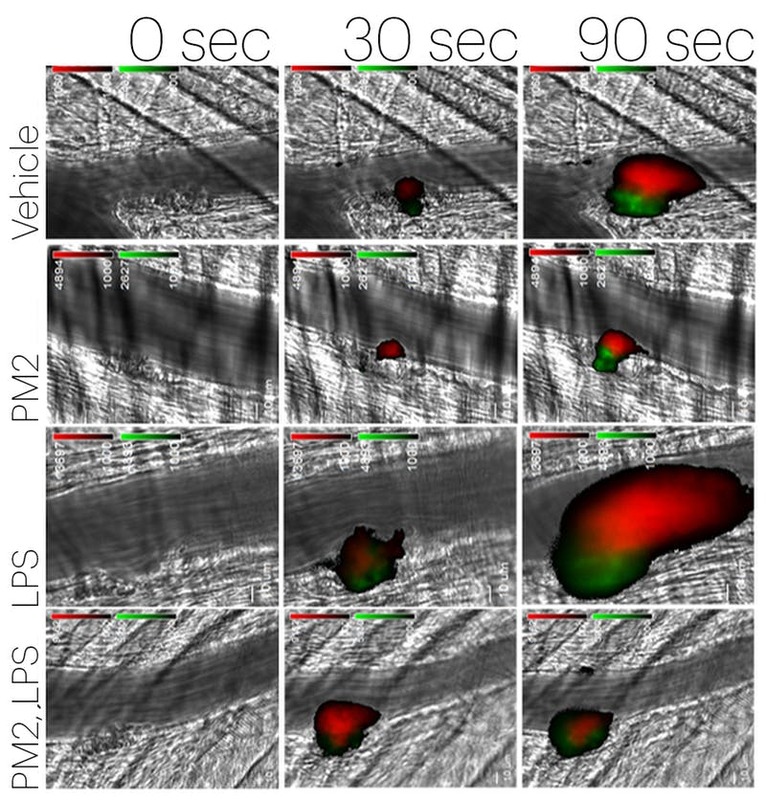 When the endothelial cells were exposed to TNF-α before being perfused with whole blood, platelets accumulated on the endothelium in a typical inflammatory response—if the cells were first exposed to parmodulin 2 and then TNF-α, platelet accumulation was inhibited and the endothelium resumed its normal function. These results indicated that parmodulin exposure blocks the thrombotic response of endothelium to inflammatory stimuli without affecting blood coagulation in humans—a significant improvement over APC. Utilizing a series of in vitro tests confirmed that parmodulin 2's activation of PAR1 also induces cytoprotective responses in endothelial cells by inhibiting apoptosis (programmed cell death) induced by thrombin, TNF-α, and the apoptotic alkaloid staurosporine through a signaling pathway that begins with parmodulin 2's binding to a specific site on the cytoplasmic side of PAR1. “We observed that the cytoprotective response induced by parmodulin 2 happened very quickly, and confirmed its rapid onset in time course and gene expression assays,” remarked co-lead study investigator Christian Peters, Ph.D., a research fellow at BIDMC. The in vivo studies in mice showed that parmodulin 2 reduces the binding of white blood cells to blood vessels and impairs platelet and fibrin accumulation at injury sites during the inflammatory response, confirming the antithrombotic and anticoagulant activity of parmodulin 2 observed in vitro. Additionally, parmodulins do not interact with many of APC's other binding partners, making it much more targeted to PAR1 and reducing other side effects. “This work provides another example of how organ-on-a-chip technology can enable faster and safer development and evaluation of drugs that could help patients around the world,” added co-author and Wyss Institute founding director Donald Ingber, M.D., Ph.D., professor of vascular biology at HMS and the Vascular Biology Program at Boston Children's Hospital, as well as professor of bioengineering at Harvard's John A. Paulson School of Engineering and Applied Sciences.